The unlikely allies are leading a push to reform sentencing guidelines for nonviolent drug offenders. 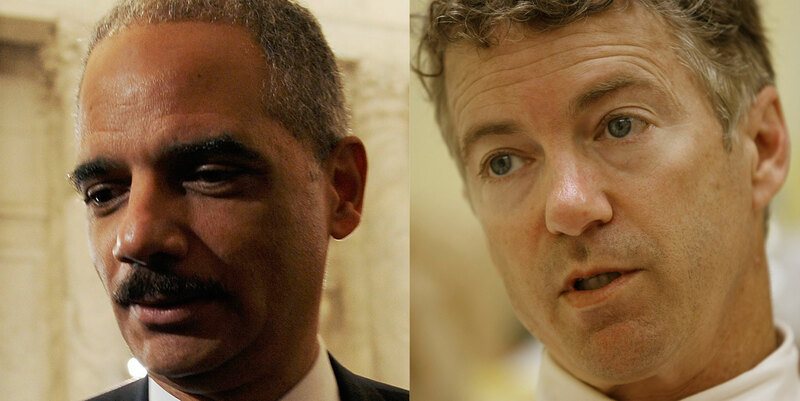 Attorney General Eric Holder and Senator Rand Paul (R-KY) don’t share a lot in common, but they agree on at least one thing: reducing mandatory minimums for nonviolent drug offenders. Their partnership unites the nation’s first African-American attorney general, who sees his legacy in a renewed focus on civil rights, and some of Congress’s most prominent libertarians, who have accused the Obama administration of trampling on personal freedom with drones, wiretaps, tracking devices and too much government. Paul is one of several Republicans to support the Obama-backed Smarter Sentencing Act of 2013. The bill, currently moving through the Senate, would reduce mandatory minimums for certain drug crimes and give federal judges more leeway when sentencing offenders. The bill would also make the Fair Sentencing Act of 2010 retroactive, granting judges the option to reduce jail time or grant releases for thousands of crack offenders serving sentences 100 times longer than cocaine offenders. According to Paul, the bill is expected to pass with support from both sides of the aisle. A similar House bill is currently sitting in committee. Holder sees the push for sentencing reform as part of a broader push for civil rights, acknowledging the disproportionate toll mandatory minimums have had on blacks in America. According to the Sentencing Project, blacks made up 34 percent of US drug arrests in 2005, while representing just 12 percent of drug users in the country. The nonprofit also found that blacks serve disproportionately long sentences for drug offenses. In 2002, the average prison term for blacks was 105 months, compared with sixty-two months for whites. Senator Paul, seen by some as a presidential contender in 2016, has been one of the most vocal critics of President Obama’s civil liberties record. But Paul’s own record raises questions, most notably remarks he’s made on Guantánamo Bay and the Civil Rights Act. In a speech at Howard University last year, Paul defended his support for sentencing and drug reform, but then denied his on-the-record rejection of Civil Rights Act protections. He also attempted to explain black history to students at the historically black university.